see from a search of the U.S. Copyright records. Please accept my humble respects. 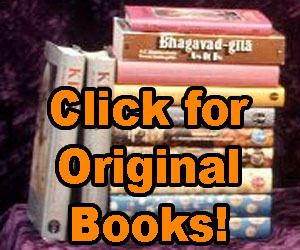 I greatly appreciate your work in advancing Srila Prabhupada’s real books. I have a question which you may or may not be able to answer. Do you know who edited the posthumously published book “Dialectic Spiritualism A Vedic View of Western Philosophy”? I have done searches trying to find out if this book is readable or not. It does have an introduction by an unmentionable offender (I can’t bring myself to type the name) so I doubt if the book is untainted. If you do have any information about this, as a newer devotee is interested in philosophy and has read “Beyond Delusion and Doubt” (which I have not seen or read) and appears to possibly be a summary of “Dialectic Spritualism”. Thank you for your time and your work. Dialectic Spiritualism was edited by Hayagriva Prabhu who is Prabhupada’s chosen editor. Prabhupada was very anxious that the book be published and he spent hundreds of hours discussing philosophy with Hayagriva and Shyamasundar [I think] Prabhus. So I can not see any reason why this book would not be readable. Srimad Bhagavatam 1.3.15“Advancement means… But we don’t change our Vedic knowledge. We do not say, “Now, Kṛṣṇa, five thousand years ago, said like this. Now we are advanced. We change this line.” Of course, others are doing. In the scriptures… Just like the Christians, they are changing the words. But you cannot do that. Then where is the authority? If you change the word of the scripture, then where is the authority of the scripture? Just like in lawbooks, there is some law made already. Whimsically you cannot, I mean to say, erase the words and put something that “It should be changed like this.” That will not be accepted. Law, if there is change… Actually, there is no change. There cannot be change. Real law means there is no change. Just like day and night, it is coming. The fortnight, the dark period and the light period, it is coming for millions and millions and time immemorial. The same law is going, going on. You cannot change. So as soon as you change, that means it is imperfect. You change.